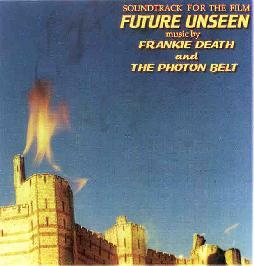 Frankie Death and The Photon Belt - "Soundtrack For The Film Unseen"
From the land down under, Frankie Death and The Photon Belt are separate entities who have teamed up for this "unseen" film soundtrack. The disc opens with a spacey intro piece that segues smoothly into "Future Unseen", a spacey, folky, David Bowie type tune with a child's voice intermittently popping in to give bits of the story. But the song has a strong melody and a powerful crashing verse that really grabbed my attention. I should also mention that Vocabularinist sent this disc along with their own so it comes as no surprise that there are some pretty wild vocals on this disc. "Dream Sequence I" is another spacey electronic track and serves as an intro to "Caught Between", another melodic tune that brought to mind an Egyptian space chorus trading verses with freaked out rappers amidst a trippy synth excursion and subtle paisley psychedelia. And "Dream Sequence II" is an aptly titled swirling collage of sounds, voices, and efx that takes an abrupt turn into the hard driving punky dancey rocker "Lovekult". "I Am (Hum Chant)" is just what the title suggests. A trippy chanting piece that leads into the drugged melodic valium tune "Garden Seed (D.N.A. Song)". You'll notice I keep mentioning intro pieces, and it does certainly seem that the band was conscious of song placement ensuring the flow and smooth transition from one track to the next. "Can You Get My Plane" is a mucho cosmic journey into electronic space mind expansion, and "Face The Music" starts out as a spaced out New Wave soundtrack to some imaginary cosmic Clint Eastwood western, and finishes as... well, just completely spaced out. Straaaaaaange... but cool. A wild ride into the cosmic and chaotic. Well done and good fun. For more information you can visit the Frankie Death web site at: http://frankiedeath.itgo.com. Hear song samples at the Frankie Death Mp3.com web site at: http://www.mp3.com/fwankie_deaf.